As a manufacturer of many high end acrylic roof coatings and a distributer of a variety of silicone roof coatings, here at Acrylux we are often in the middle of a very familiar topic of discussion - will acrylic or silicone be a better fit for my roof? In order to address this question, we must first examine the pros and cons of each waterproof coating. A few of the performance indicators that we will begin to compare are product cost, coating sheen, ease of use, environmental safety, and ponding water resistance. The recent emergence of silicone products to the roof coating market has come along with one predominant issue, the extremely high costs. Silicone products cost on average between 2 and 3 times the amount of their acrylic counterparts. Acrylux’s best selling acrylic Flat Roof Mastic, retails at under $130 compared to competing silicone based products starting at over $275. Considering the young nature of silicone coatings, more suppliers are beginning to enter the market. This increase in competition has begun to spur a decrease in silicone’s price, but a noticeable decrease in quality is evident in these products. Both products will lay down a beautiful coat the week of application, but how will each coating hold up years down the road? A major benefit of working with acrylic roof coatings is they will retain their white luster for a longer period of time than silicone. The nature of silicone products causes them to start compiling a dirty, yellow appearance after only a couple years of application. Acrylic products resilient properties allow it to hold up its reflectivity for years, keeping houses cooler and saving AC costs. The tendency for silicone products to collect dirt and grime kills reflectivity and reduces the roof’s aesthetic appeal. Silicone coating on a flat roof next to the tile portion which was done in acrylic. Both roofs were done at the same time. A major selling point for silicone roof coatings is the claim that these coatings can be applied extremely thick at a high millage, and may only require one coat. Although silicone products do provide a very high millage, this makes them noticeably more difficult to apply while also often requiring a second coat. Silicone coatings are very thick and sticky, which is quite difficult for applicators to roll out. If attempting to spray the material, it requires heavy duty equipment that many contractors may not have on hand. In addition to the difficult application conditions, silicone based products also require a solvent clean up, with a solution such as mineral spirits, that is more toxic than the water clean-up alternative. Due to silicone being moisture activated, applicators must be careful of opening expensive silicone buckets on high moisture days due to the risk of the product drying up and solidifying within the bucket. Acrylic roof coatings roll out smoothly, spray with basic sprayer equipment, require basic water clean -up, and can be saved in the bucket for 5 years of future use. When conducting the environmentally friendly argument between these two products, acrylic coatings come out as the clear winner. The fundamental difference between these coatings is that silicone products are made up of a chemical solvent, while this solvent is replaced by water in acrylic products. Acrylic coatings have VOC (Volatile Organic Compound) levels almost 3 times lower than silicone competitors, and also have much less odor given off. Acrylux’s Roof Mastic product advertises a VOC of around 75 g/L compared to a comparable silicone coating being listed as 240 g/L. 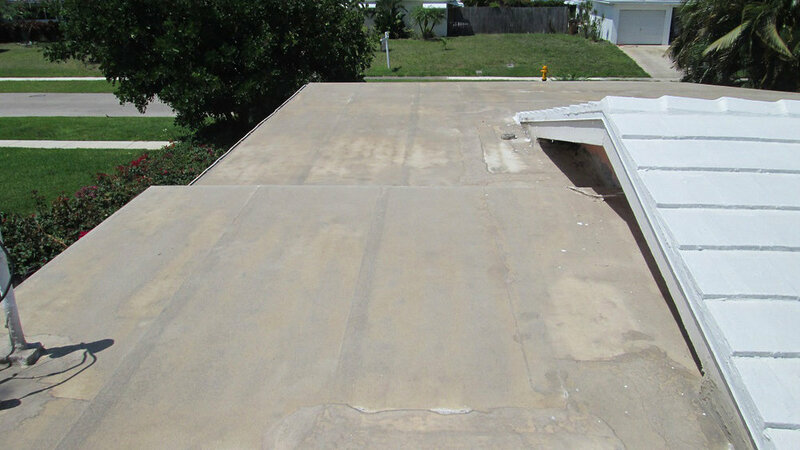 Due to their water base makeup, acrylic roof coatings have one main deficiency: withstanding ponding water. Silicone roof coatings excel in this environment. Silicone coatings will remain perfectly intact under large amounts of ponding water, and can even be applied properly being applied on a humid, moist day. Here at Acrylux, we recommend a combination of acrylic coatings for any flat roofs with proper drainage or less than 3/8 an inch of ponding water. A flat roof with any ponding water greater than this amount will require the use of acrylic coatings with fabric embedded or a silicone coating for optimal performance. Everyone’s situation is unique and will require specialized advice to come up with the perfect coating to fit the job. After considering the properties of both acrylic and silicone products, we arrive at the conclusion that acrylic roof coatings are the far more cost efficient, long-lasting, and effective method of roof sealing. Silicone is great for addressing severe ponding water… but almost everything else about it is a potential negative.